Energy and Excitement of Auto Racing? How About Seeing Your Company's Name On a NASCAR Style Stock Car? 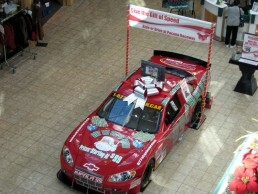 Let us design and build your NASCAR style stock-car and showcase it before thousands of students at Pocono Raceway. Yes, Pocono Raceway, the NASCAR track with the highest population density around it. The 65 million people that live within a 200-mile radius can’t wait to ride or drive in your racecar and take home pictures standing next to it. Transport services are also available for off-site promotions at a location of your choice. You already know that you have the best product or service on the market, let us help you get the word out! We can show you how to reach the most people in a cost effective manner. With a custom tailored Motorsport Marketing Plan you can reinforce your brand identity and provide a platform to enhance and differentiate your products while driving sales upward. Many successful companies, both large and small, have made Motorsports an integral part of their marketing strategy. Below are some of the companies and their race cars that have found success using this innovative and very effective method of reaching the masses. OMG!!!! This was the best Father's Day gift I have given my husband. He light up like a christmas tree when he saw the track. He glowed. He kept on thanking me over and over again. The class was amazing he said. Everyone from the check in guy at the gate to the pit crew were so nice and answered all of our questions. Wow! What else can I say. My wife bought me this drive as a gift for my 50th Birthday. I felt like I was a kid again reliving my childhood wishing I was a race car driver. This fulfilled that childhood dream for a moment in time and what it felt like to drive a racecar. I am so glad I did this and really look forward to doing this again sometime soon.